S. S main drain made from 304 grades stainless steel plate with stainless steel frame for grouting in concrete pools. 200 mm square perforated drain grille flow is 10m3/hr max. Minder abs round main drain . 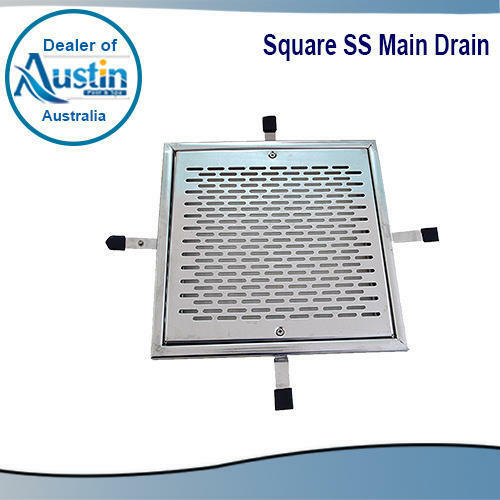 Minder abs square main drain 1f x 1f. PW S. S main drain 1f x 1f. PW S. S main drain 1. 5f x 1. 5f. PW S. S main drain 2f x 2f. Our organization is ISO 9001:2008 certified and is the leader in supplying water equipment with over a decade of experience. We have proven ourself as a complete water management company providing equipment for swimming pools, spa, and fountains. We have liaised with market leading vendors for procuring all our products from them. As a result, our products offer the best quality, efficiency, and performance. Our procuring agents ensure to recheck all the products as per the parameters defined by the industry. We are the prominent distributor and importer in this cut throat market. We have established a wide distribution network that helps us in delivering our products to our clients within the committed time frames. Also, appropriate warehousing and transit facilities ensure that our products reach the clients without any defects. Moreover, we can offer customization of our products and have thereby developed an excellent rapport with our customers. Our ethical and transparent business policies have further helped us maintain an excellent client retention. Our product range includes Swimming Pool Filters, Prefabricated Swimming Pool, Spa Heater, Swimming Pool Cover's, Swimming Pool Ozonator, Swimming Side Mounted Sand Filter, Cartridges Filter, Fountain Underwater Light, Swimming Pool Skimmers, Swimming Pool Nozzles, Swimming Pool Motor Pump, Swimming Pool Ladders, Swimming Pool Drain Covers, Swimming Pool Cleaning Equipments, Suction Sweeper Machine, Swimming Pool Games, Inline Chemical Feeder, Swimming Pool Grating, , Swimming Pool Furniture, Life Saving Equipment, Water Treatment Chemicals, Pelletised Activated Carbons, Powder Activated Carbons, Water Softeners and many more.